This year’s Sun Valley Summer Symphony benefit concert will feature the renowned saxophonist Branford Marsalis with the orchestra and with his quartet. 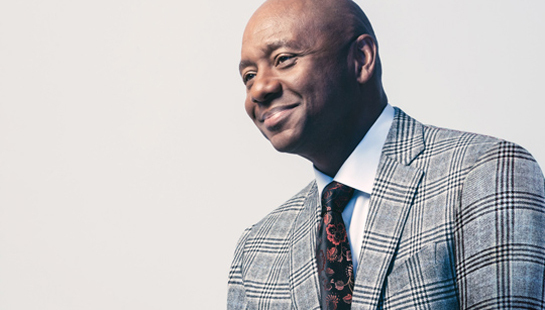 The Sun Valley Summer Symphony is pleased to announce that Branford Marsalis will perform at its 2019 Gala Concert. Marsalis is acclaimed for both his classical work with orchestras, as well as his Grammy Award® winning work as a soloist and with the Branford Marsalis Quartet. On Sunday, Aug. 11, 2019, he will join Maestro Alasdair Neale and the Sun Valley Summer Symphony for several classical works featuring saxophone, after which the Branford Marsalis Quartet will take the stage for a set featuring famous hits as well as music from their upcoming album (to be released March 1). Marsalis has always loved classical music; one of his first albums was the French impressionist disc titled “Romances for Saxophone” in 1986. In 2008 he toured with Philarmonia Brasileira, playing music by Villa-Lobos and Milhaud. Making his first appearance with the New York Philharmonic in 2010, at a concert in Central Park, Marsalis was invited to join them as soloist in their 2010 – 2011 season where he unequivocally demonstrated his versatility and prowess, bringing “a gracious poise and supple tone…and an insouciant swagger” (New York Times) to the repertoire. He recently recorded Gabriel Prokofiev’s “The Saxophone Concerto,” which Prokofiev wrote for him. Recent orchestra collaborations have included the Philadelphia Orchestra, the Chicago Symphony, the Detroit Symphony, and the National Symphony. On the jazz front, after several years playing with his older brother in the Wynton Marsalis Quintet, Branford formed The Branford Marsalis Quartet in 1986 and has sustained this group as his primary means of expression. The quartet is known for the telepathic communication among its uncommonly consistent personnel, and its deep book of original music replete with expressive melodies and provocative forms. They have long been recognized as the standard to which other ensembles of its kind must be measured. Reserved ticket prices range from $85 on the lawn and in the Pavilion to $1,750 for the Artist Package. New this year, the Artist Package is limited to 30 tickets and, in addition to a pre-concert cocktail reception, VIP parking, and premium seating at the concert, includes a private dinner with Mr. Marsalis in an intimate setting, post-concert. Sponsor Packages, at $1,250, include a pre-concert reception, VIP parking, and a seated dinner post-concert at a private home with the opportunity to meet Mr. Marsalis. Tickets at the $275 and $550 levels include the pre-concert cocktail reception and premium seating in the Pavilion. General admission lawn tickets are available for $85, and the concert will be broadcast live on the Pavilion lawn’s 25-foot, LED screen. Funds raised from the event support the Sun Valley Summer Symphony and its community initiatives, including world-class admission-free concerts that attract over 50,000 people annually and music education experiences to over 500 music students every year. Tickets go on sale to Symphony donors at the $1,000+ level on March 6, and to the general public on April 10, 2019, at 9:00 a.m. (MST). Tickets may be purchased online at svsummersymphony.org or by calling 208-622-5607. Artist and Sponsor packages are only available by phone. General admission lawn tickets will be available online only. The concert will begin at 6:30 p.m. Gates open at 5:00 p.m. for Pavilion and lawn seating.